Fun Swimming Pool Party Ideas for kids! Use these great ideas to make your next pool party extra special. Unique ideas for Pool Party invitations, decorations, food, favors, games and activities that will bring the whole pool party theme together quickly and easily! 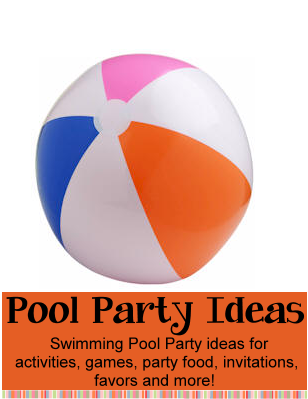 We've created a whole page just to hold all the pool party games - print them out and keep them handy during the party. Choose the ideas that fit your style and budget and put them together for the perfect party. Write party information on beach balls with a black permanent marker and send deflated to guests. Write pool party information on Frisbees and send to guests - ask them to bring the Frisbees to the party! Send sunglasses with a colorful tag that has the information for the party. For a pirate pool party send a treasure map style invitation. In the trees outside the party venue hang small blow up swim rings, swim goggles, nose plugs, etc. Use colorful beach towels for table cloths. Fill buckets with sand and tie helium balloons to the handles. Hang fishnets around the edge of the party and fill with shells, crabs and seahorses. Hang blow-up beach balls around the party area. Place swim rings around the mailbox or in front of the party venue to tell party guests "This is the place!" Buy cheap flip-flops for each guest. Cut colorful fabric into strips 1 - 1.5 inches x 3 - 4 inches. You'll need about 80 cloth strips per pair of flip-flops. Tie the strips onto the top of the flip-flop - covering the whole top part. Really fun and the kids love them! Buy enough blow-up beach balls for every guest. Blow them up and let kids autograph each others with permanent markers. Fun activity while presents are being opened or kids are eating. Goldfish crackers served in large conch shells. Shell pasta with Alfredo sauce. Blue Jell-O with Swedish fish inside. Serve in clear containers. Sandwiches cut with a fish shaped cookie cutter. Jell-O jiggles cut into fish, starfish and shell designs with cookie cutters. Set out a sundae bar where kids can make their own sundaes. Sprinkles, syrups, toppings and fruit. Let the kids decorate their own BIG cookie or cupcake. Pool noodles - find them at the dollar store for cheap!